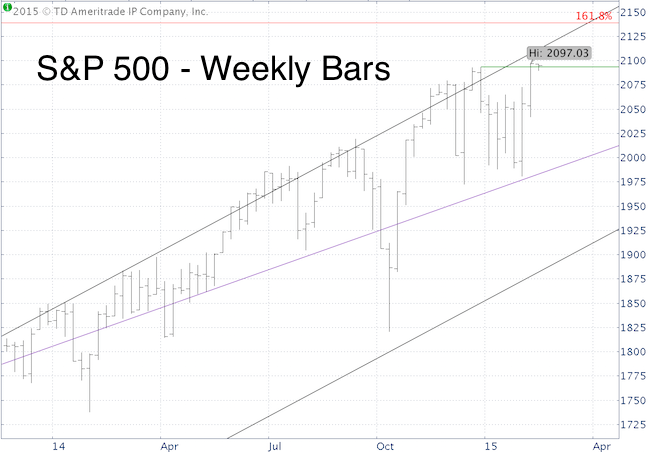 The S&P 500 is at new all time highs, and, as the weekly bar chart shows, there’s some room until it hits next resistance. 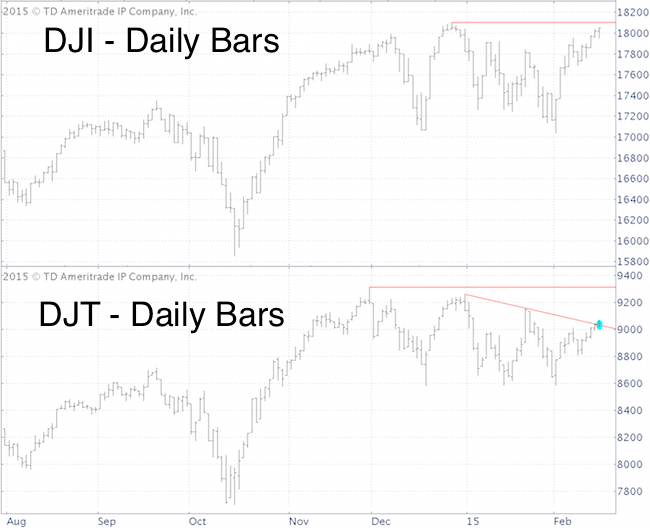 However, the Dow Jones Industrial Average (NYSEArca: DIA) and Dow Jones Transportation Average (NYSEArca: IYT) failed to surpass their prior highs. But, the Dow Jones Transportation Average (DJT) managed to close above red trend line resistance (blue circle), which is short-term bullish. Viewed in isolation, the S&P 500 (NYSEArca: SPY) breakout is bullish, but it has not yet been confirmed by other major market participants. The trend is your friend … until it ends. Seasonality suggests a rally pause. Here’s a brand new and detailed S&P 500 seasonality chart. Seasonality is not the only force to drive stocks, but it’s one of the indicators I follow. 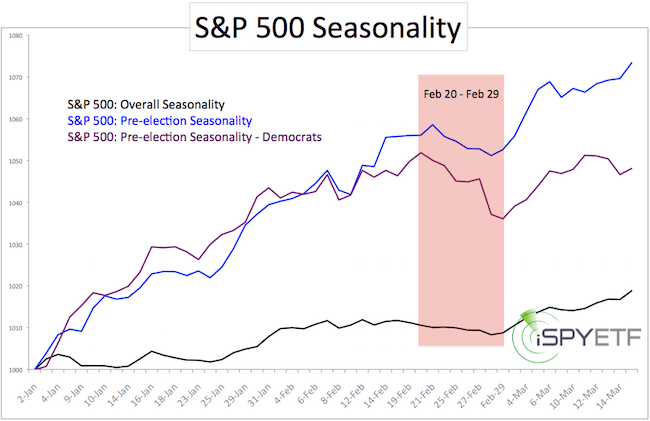 The S&P 500 seasonality chart (for pre-election years) shows four notable weak spots (seasonality is based on 64 years of daily closing prices). One of them, although not very intimidating, is the second half of February (others are in May, July and October – a full year seasonality chart is available via the Profit Radar Report). The chart below highlights the February weak spot. Purely based on seasonality, the S&P 500 (NYSEArca: SPY) is unlikely to follow through on its bullish technical break out, at least not in February. In early November, gold finally reached my down side target and I became a self-proclaimed gold bull, at least for 2015. On queue, gold started cruising higher and everything went according to plan … until something odd happened in late January. 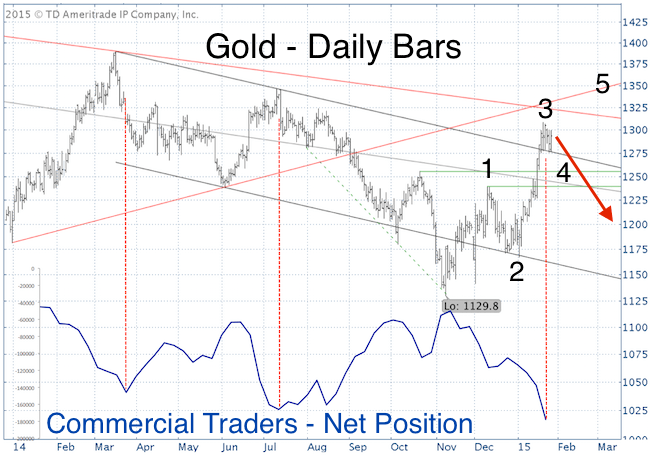 The January 27 Profit Radar Report noted that commercial traders (smart money) were selling gold at a rapid pace, and published the chart below. The dashed red lines illustrate what happened the last two times commercial traders fled gold. Gold will trace out a wave 4 correction followed by wave 5 higher. Target for a wave 5 high is around 1,330. In addition to bearish sentiment developments, the Profit Radar Report cautioned of weak gold seasonality. 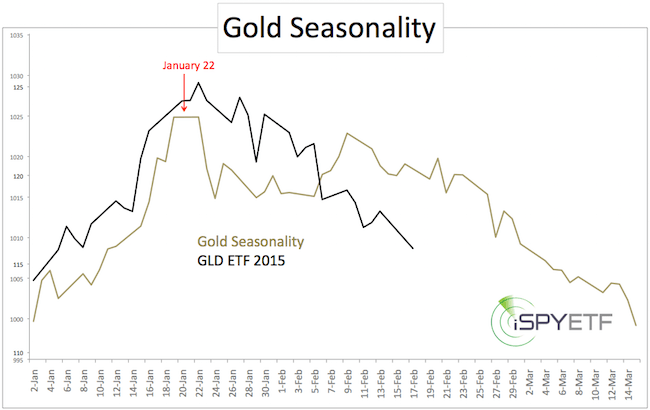 The chart below plots the actual price of the SPDR Gold Shares ETF (NYSEArca: GLD) against gold seasonality up until mid-March (a full year gold seasonality chart is available to subscribers of the Profit Radar Report). It’s hard to ignore the textbook November bottom, but it’s also hard to ignore the January sentiment and seasonality warnings. The risk of more down side is real, and my inner gold bull is set on hibernation mode for now. As per the second Elliott Wave Theory option discussed above, new lows are at least possible. Update: Will the S&P 500 Roll Over Again? I was wrong! I expected the S&P 500 to rally from 1,990 to 2,080 and roll over to new lows. The rally happened, the subsequent reversal did not (at least not yet). Will the S&P 500 roll over later? Here’s an updated S&P 500 forecast. 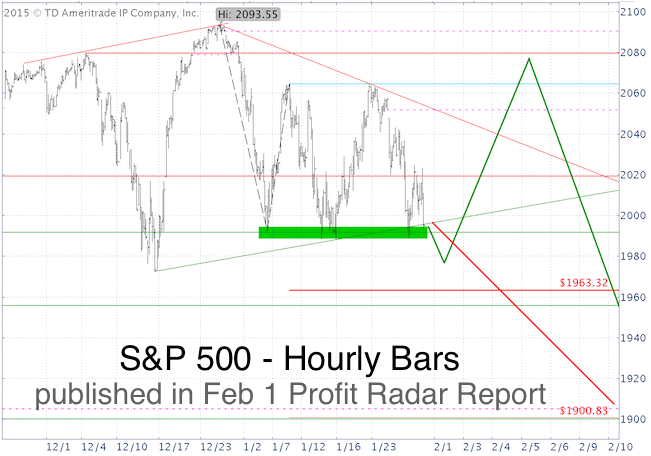 February 1 Profit Radar Report: “Near-term support around 1,990 is becoming quite obvious. When support is too obvious, the market may want to fool investors with a seesaw. 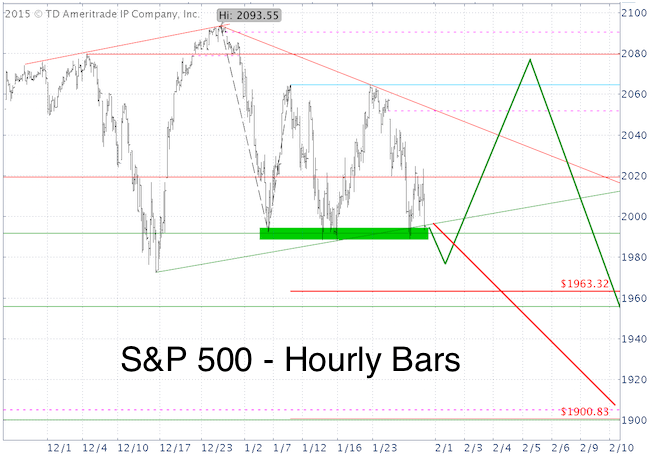 A drop below 1,990 followed by a reversal and rally towards 2,080 (green projection in chart below) is most likely” (the alternate red projection would only have come into play with sustained trade below 1,990). The S&P briefly dropped below 1,990 and rallied to 2,080 … and beyond. In fact, there was a new all-time S&P 500 (NYSEArca: SPY) high today. 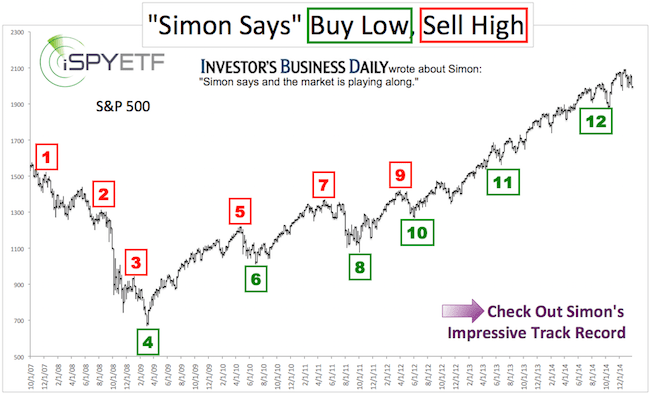 The new all-time high is in harmony with the longer-term forecast of the January 4 Profit Radar Report: “Based on the ‘secret sauce indicator’, we expect new all-time highs following correction lows” (for the benefit of paying subscribers, I replaced the name of the actual indicator with ‘secret sauce.’ More details about the reliable ‘secret sauce indicator’ is available here). However, as implied by the original green projection, I expected the S&P 500 to roll over around 2,080 and drop below 1,980.9 (February 2 low) at the minimum. In fact, I would have preferred to see 1,900 for a great buying opportunity. Obviously the S&P 500 did not roll over around 2,080, but do I still expect new lows? Below is an updated version of the February 1 chart. The green circles mark bullish touch points. There were other telltale signs along the way hinting at more immediate bullish potential. The February 6 article – Will New MidCap Highs Propel All Stocks Higher? 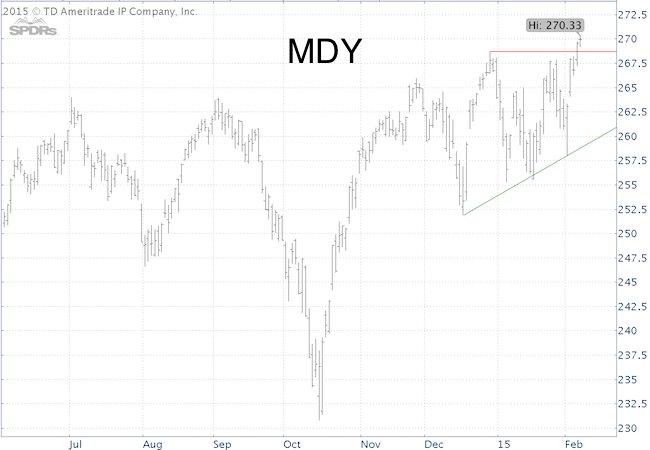 – noted the new SPDR MidCap ETF (NYSEArca: MDY) all-time highs, the S&P 500 trend line breakout and solid internal market breadth. 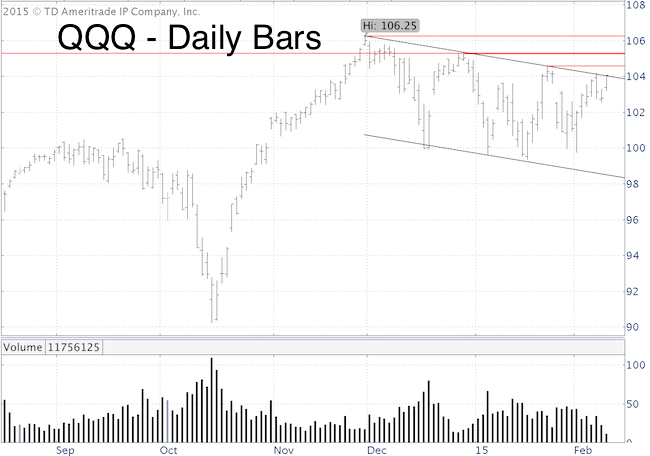 There was also the Nasdaq QQQ ETF (Nasdaq: QQQ) breakout (February 10: Can the Nasdaq QQQ ETF Break out of a Bull Flag Pattern and Rally 10%?). Will this be Another Extended Rally? That’s not the kind of optimism indicative of a major top. The new ATH essentially eliminates the immediate risk of new lows (below 1,980.9). A smaller correction is still possible, but the overall environment is changing towards ‘buy the dip’ … for now. Can the Nasdaq QQQ ETF Break out of a Bull Flag Pattern and Rally 10%? A bull flag is described as a consolidation period that interrupts a sharp, almost vertical rally. QQQ had a sharp rally from the October low and a pro-longed consolidation period thereafter. The classic bull flag breakout target projects a 10% rally. The Nasdaq QQQ ETF (Nasdaq: QQQ) chart is simple, but packed with information. QQQ has been consolidating for 2 ½ months. The consolidation range is defined by a parallel channel with a slant to the down side. Channel resistance is at 104. 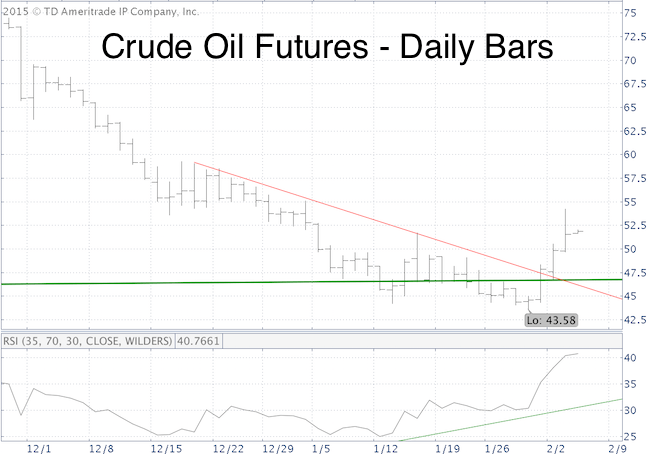 Resistance created by the January 23 and November 29 highs is at 104.58 and 105.25. There’s also a Fibonacci projection level, going back to the October 2002 low, at 105.29. I’ve read some articles that describe the channel consolidation as a bull flag. What is a bull flag? As the name implies, this pattern looks like a flag. A bull flag represents a digestive period after a sharp rise. In a bull market, the flag is usually formed with a slight down trend and tends to separate two halves of a steep rally. If this is indeed a bull flag, a breakout above 104 projects a target around 120. Is this a bull flag? Duration: In their technical analysis books, authors Pring, Edwards and Magee state that flags can form for a period as short as 5 days or as long as 3 – 5 weeks. But a formation that lasts longer than 4 weeks should be treated with caution. This particular flag pattern is already 10 weeks old. Trading volume: Trading volume should diminish appreciably and constantly during the pattern’s construction and continue to decline until prices break away from it. Trading activity dried up in February, but saw significant volume spikes early in the pattern. In summary, the 10-week long QQQ consolidation pattern looks like a bull flag, but it does not meet the qualifications of a bull flag. Nevertheless, certain measures of sentiment show above average pessimism for the Nasdaq QQQ ETF, which could support further up side. Here is a bit more context: The SPDR S&P 500 ETF (NYSEArca: SPY) is gnawing on similar resistance, and the SPDR S&P MidCap 400 ETF (NYSEArca: MDY) just broke to new all-time highs. The 104 – 106.25 QQQ range appears pretty significant for the next big move. I’ve taken a pretty bold stand regarding the next S&P 500 move, and am watching the QQQ ETF carefully for clues. 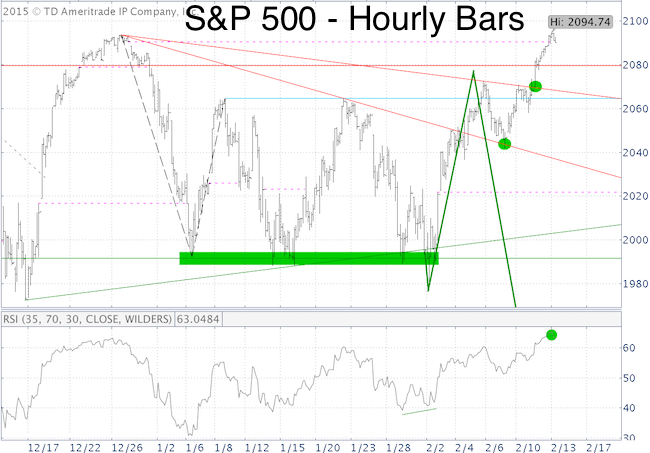 My bold S&P 500 call is available here with the latest update posted here. Will New MidCap ETF Highs Propel All Stocks Higher? Quietly, and in the shadow of it’s more popular and range bound S&P 500 cousin, the SPDR S&P MidCap 400 ETF (NYSEArca: MDY) just soared to new all time highs. Most market technicians would grade this performance as bullish, and it may well turn out to be bullish. “A drop below widely watched support around 1,990 followed by a reversal and rally towards 2,080” is very likely. The red projection would only come into play if trade stayed below 1,990. Here is an updated look at the green projection. This projection has played out perfectly thus far, and there’s no concrete reason to abandon it. Nobody wants to be William J. The SPDR MicCap ETF breakout, when viewed in isolation is bullish. 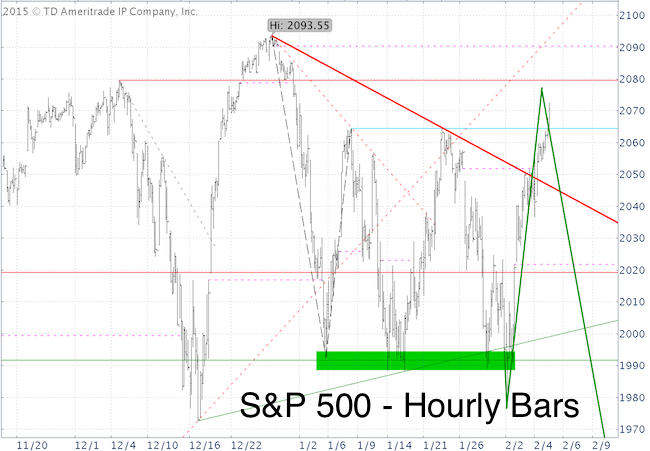 Even the S&P 500 broke above bold red trend line resistance, which is also bullish. Internal market breadth has been solid, which would also allow for further strength. However, from a psychological perspective, a reversal after the S&P 500 breaks out of its recent trading range (blue line), would trip up a great number of investors, which is what Mr. Market likes to do (it did so at the January 22 high, with a ‘gnarly’ MACD signal). For now I’ll stick with my green projection. The market will probably tell me within the next few days if I’m wrong. Continuous updates are available for the Profit Radar Report. Crude oil prices tumbled 60% since last June, but oil rallied 5% or more each of the last three days and closed 20% above last week’s low. Is oil getting ready to climb higher? The pieces are in place for a tradable rally. 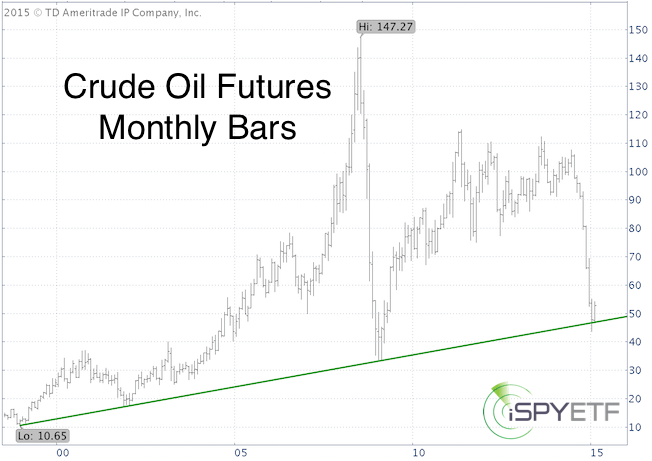 The long-term crude oil futures chart shows strong support around 46. Trade tried to wear down support, but ultimately it held. On January 28, we looked at the broader Reuters/Jefferies CRB Commodity Index (Key Commodity Index at Major Inflection Point May Provide Clues for Oil). This index was also at key support, which provided a stop-loss for Oil ETFs like the United States Oil ETF (NYSEArca: USO) and iPath Oil ETN (NYSEArca: OIL). Oil seasonality is turning bullish in February. 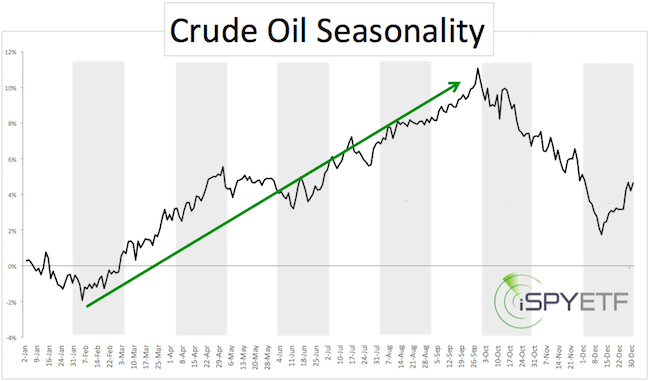 My seasonality chart is based on 31 years of historical oil price patterns. This seasonal trend is too pronounced to ignore. Oil is long-term oversold and short-term overbought. This may cause some short-term wiggles, but based on seasonality oil prices should climb higher. Next resistance is around 55. A move above 55 should lead to further gains.